Caramel candy chocolate lovers rejoice! 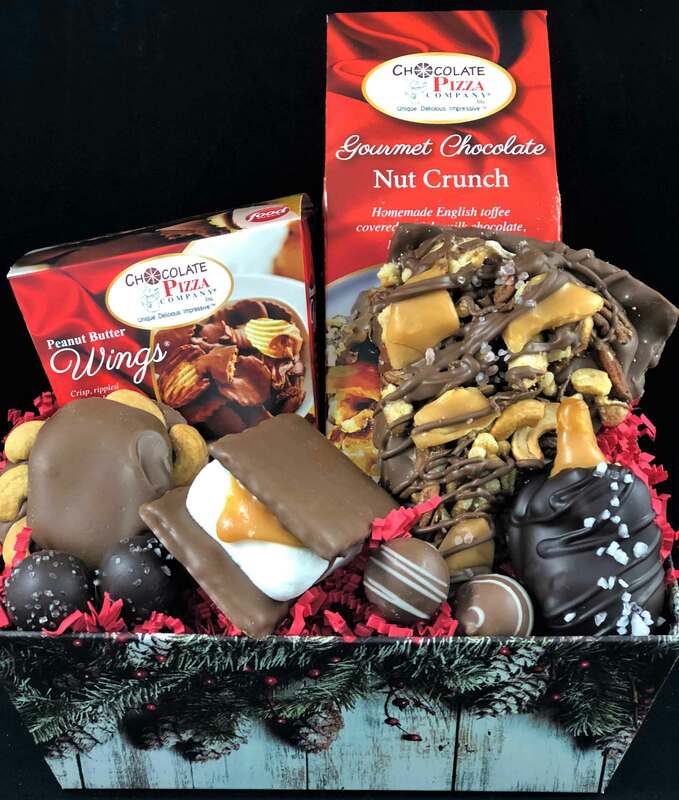 This gift basket delivers a bounty of handmade caramel candy delights starting with a 9 oz Drumstick Chocolate Pizza Slice with its cashews, pecans, pretzels, caramel and sea salt atop gourmet milk chocolate blended with homemade English toffee. Wow! Then we add a Caramel & Nut Drumstick, Caramel S’more, Pecan/Cashew Cluster with caramel, and 4 chewy caramel bites. 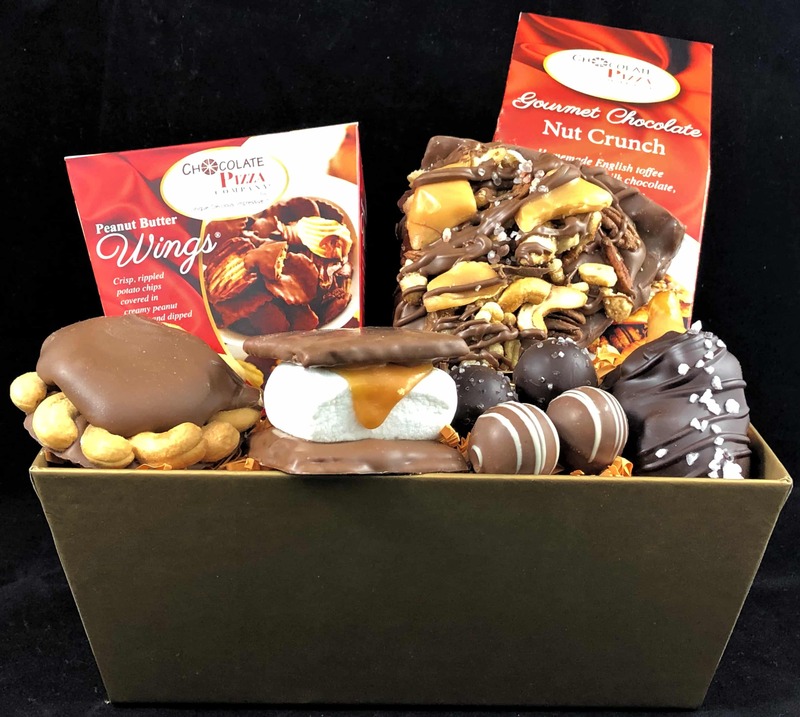 We finish this impressive gift basket with our famous Peanut Butter Wings (8 oz) – crisp, rippled potato chips covered in creamy peanut butter and drenched in chocolate and the classic Toffee Nut Crunch (6 oz). 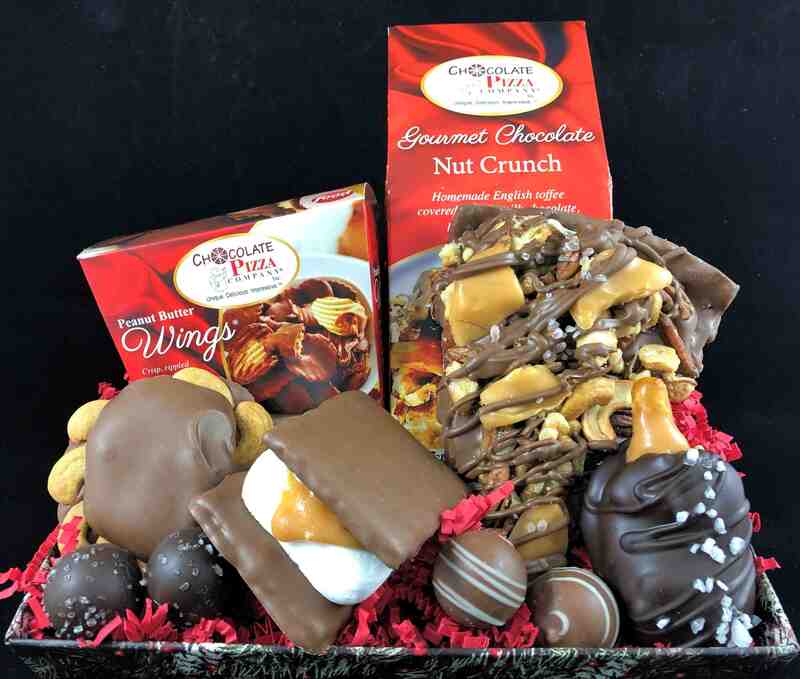 Beautifully presented with over-wrap and bow the Caramel Candy Chocolate Gift Basket is an all-occasion winner! 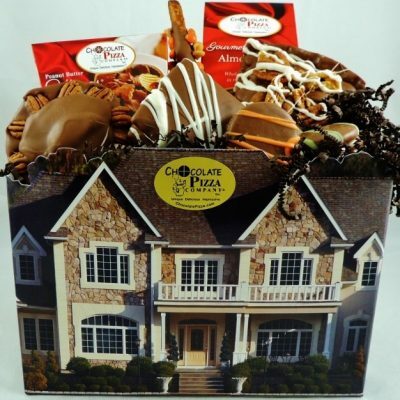 Gift baskets are an ideal choice for birthdays, anniversaries, graduations, get well, congratulations or holidays. They are appropriate in every gift-giving situation and offer a variety of products that give the lucky recipient so many options on what to enjoy first. Customers browsing different vendors for gift baskets should focus on what the vendor features in their pictures of the basket. In most mass-produced gift baskets, the pictures will show boxes arranged in a basket with a draping bow. Their trick is to show you perfect packaging rather than the chocolate because the amount of chocolate the basket actually contains is minimal and usually mass-produced candy aisle sweets. But not Chocolate Pizza Company. 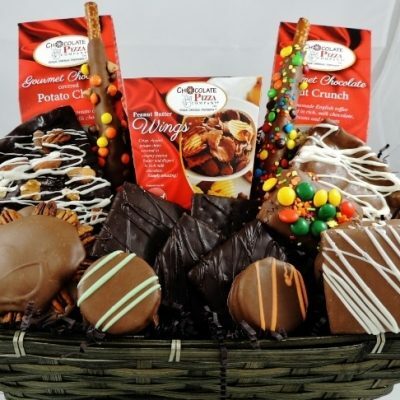 In our gift basket pictures we show you the chocolate – and lots of it. Our gift baskets are packed with unique, one-of-a-kind, handcrafted chocolate specialties that make our gift basket shine. We’re proud to show you our chocolate. 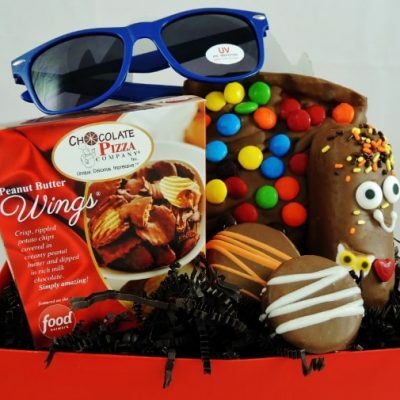 Featured on national media like CNBC, Hallmark Channel, Food Network, CMT and in Forbes, People and Entrepreneur magazines, Chocolate Pizza Company and owner, Ryan Novak, have introduced America to creative, gourmet chocolate specialties like Chocolate Pizza and Peanut Butter Wings. 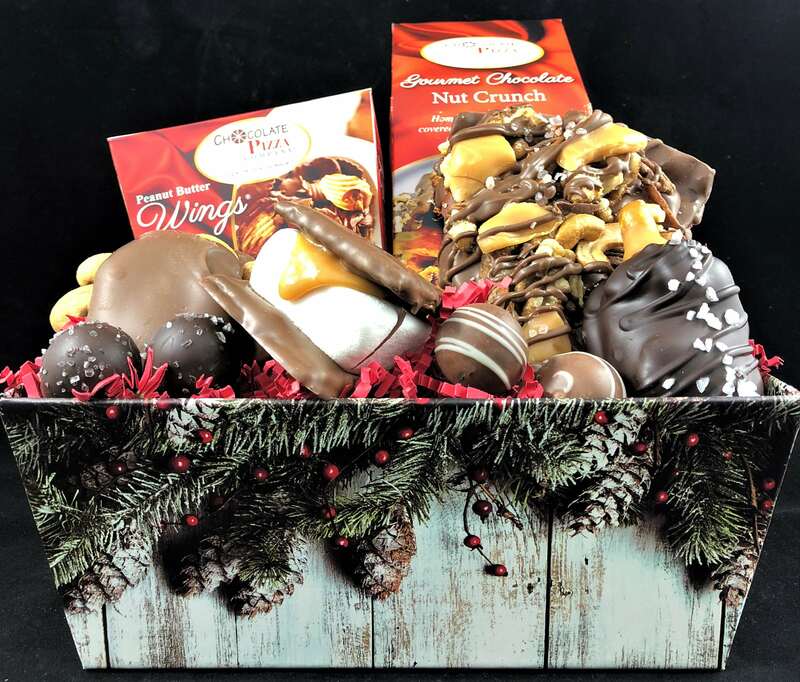 Caramel Candy Chocolate Gift Basket is a gem in their gift-giving line-up that includes unique confections for holidays, business or personal occasions.